Donald Trump has been president-elect for less than a week and already he’s sending shockwaves through immigrant communities. On Sunday’s episode of “60 Minutes,” Lesley Stahl asked Trump whether he was going to follow through on his pledge to deport millions of undocumented immigrants. “What we are going to do is get the people that are criminal and have criminal records–gang members, drug dealers–we have a lot of these people; probably 2 million or it could even be 3 million. We are getting them out of our country or we’re going to incarcerate, but we’re getting them out of our country–they’re here illegally,” Trump said. “After the border is secured and after everything gets normalized, we’re going to make a determination on the people that you’re talking about, who are terrific people–they’re terrific people–but we’re going to make a determination at that. But before we make that determination, Leslie–it’s very important–we want to secure our border,” he said. Many of those calls are coming from undocumented immigrants fearful of what the future might hold. Among the many individuals now living in fear is a young man who came to the United States with his family when he was 11 years old. Luis Gomez is one of the estimated 740,000 young people in the U.S. who have qualified for the Deferred Action for Childhood Arrivals, or DACA, that President Barack Obama issued as an executive order in 2012. It extends protections to young people who arrived as undocumented immigrants before their 16th birthday. But now as he’s set to graduate from IIT with a degree in biochemistry Luis Gomez says his future has suddenly become very dark. Chicago has a sanctuary city ordinance which has suddenly become a subject of national discussion. 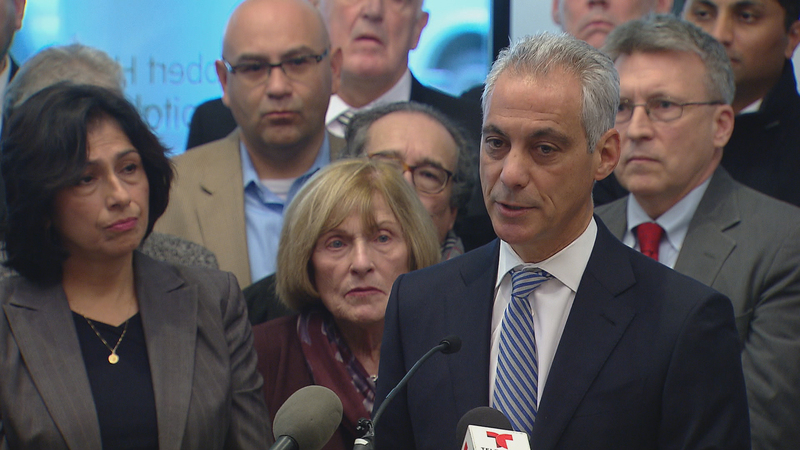 Four years ago, Emanuel and the City Council passed a law saying that police could only give federal agents information on undocumented immigrants that had arrest warrants out on them or were convicted criminals. But that sanctuary ends at the city limits. So far Illinois has not followed California, Connecticut, New Mexico and Colorado in making the entire state an immigrant sanctuary. It’s made headlines in the wake of the Trump victory because some people say anyone here undocumented is breaking the law. Sanctuaries aside, there have been a great number of deportations during the Obama administration. Obama has deported more undocumented immigrants than any previous president; an estimated 2.5 million through last year (this year’s figures are not yet reported). What the president-elect seems to be suggesting is that he wants to get to at least that many very quickly. By one estimate provided by the American Action Forum, a conservative-leaning think tank, doing so would cost tens of billions of dollars and would require thousands of new immigration attorneys, compared to the 1,300 or so there are right now. And the Department of Homeland Security’s Immigration and Customs Enforcement would need tens of thousands of additional workers. One of the leading voices in congress for immigration reform is U.S. Rep. Luis Gutierrez who has not been successful under a Democratic president. Here’s what he had to say today.